Ghost hunting is big business these days. It takes serious cash to attain a collection of data capturing and analysis tools to make your research a success, after all you have to get the latest and greatest gadgets if you’re going to troll around at night playing scientist. The trend is such that the owner of a new business in downtown Springfield, Ohio is cashing in on it, confident of long-term success. Darin Hough’s Ghost Hunting Source offers shoppers paranormal research equipment in a truly unique niche market. Perhaps a bit morbidly, Hough explained, “As long as people are dying people are going to have an interest in it.” He’s not alone. Morticians, cemetery owners, and fraudulent psychics and mediums have been cashing in on the deaths of loved ones for centuries. The truth of the matter is that there’s really no better time to open a store like this. It’s possibly the only place outside of the internet where you can buy an electromagnetic field detector, an infrared camera, and a dowsing rod at the same time and take them home the same day. The questionable “science” of reality television fuels demand for these items as each group and show tries to patent and trademark the latest innovations in paranormal research. Hough wanted to offer fellow investigators the chance to get their hands on the exact equipment as seen on these shows and play scientist. Sadly, there aren’t any proton packs, ecto containment units, or the latest edition of Tobin’s Spirit Guide available for purchase. Ghost Hunting Source in an old industrial site known as the Robertson building and comes with the perfect coincidence- other tenants of the building have told Hough they think it’s haunted. And why shouldn’t they? Increased foot traffic means their stores will benefit as well. Naturally, he’s hoping to conduct a ghost hunt there as part of the store’s grand opening party on Oct. 19 with Miami Valley Paranormal Services, a group which he founded 6 years ago. Hough promises to instruct newbie ghost hunters on how to properly use what they buy. Readers of Across the Great Divide have heard of these laughable devices before in “The Harsh Truth about Ghost Boxes”. Still, this all amounts to big money. Last year alone he claims to have sold more than $220,000 in gear at his online storefront and shipped as far away as Australia and Russia. Another gadget he’s peddling is something labeled E-POD-AMP, a $100 pod that features a series of lights that remain lit until static electricity is detected, and touted as ideal for trying to decipher why the hair on your arm is standing up. Sure, because we all know that static electricity isn’t a normal, everyday fact of physical life and only occurs when an apparition is around. In addition to all of the high-tech gear available at the store- such as full-spectrum video cameras- Hough also carries low-tech, old-world tools including dowsing rods, tarot cards, and sage incense. Interestingly enough, the one thing conspicuously missing from the shelves at Ghost Hunting Source is a Ouija board, the infamous board made and sold by Hasbro. I would love nothing more than concrete, scientific proof of paranormal activity- which I wholeheartedly believe in the possibility of- but the unfortunate truth is that the greed of capitalism is at its most successful when it prays on the ignorance and gullibility of the uninformed shopper. There are a number of websites that sell paranormal and ghost hunting equipment and software. These sites offer very little in terms of real-time customer service to answer concerns and questions about the equipment offered and the correct usage of them. It’s a big wheel of supply and demand as shows like Ghost Lab act more like hour-long infomercials pushing interest in the newest must-have gadgets. Fans see these cool toys with wide eyes and want to find them at any price so that they can play like the Big Boys on TV. This is why these programs only show those incidents wherein the devices “prove” activity and not the other 99 percent of the time when it acts erratically or not at all. Even the money machine known as SyFy’s Ghost Hunters has jumped into the game. They highlight innovative and glitzy gadgets for an hour and then offer fans the opportunity to purchase their very own at the “Ghost Gear Store”, an online shopping site run by NBC Universal. My, how convenient. Trust me, their checkout lanes are counting on it. A recent death went largely unreported. There was no outpouring of grief. No endless video loops in the network news feeds. It went unnoticed because it was a death that had been slow and arduous, occurring over the last 20 years. Like a bedridden relative whose end was known to all, so that when it finally came it was of no surprise and everyone was glad to see an end to the suffering. I am talking about ghost hunting. In the period between 1880 and 1980, paranormal research was a science taken- at least in part- seriously among academics who loved the intellectual debate, albeit with a skeptical chuckle amid the discussions that took place in universities and scientific societies around the world. Hey, even the study of psychology and the treatment of mental illness was considered fringe science for decades. In the 1990’s the reporting of paranormal activity became popularized in serious news-style shows like FOX Network’s Sightings. It became serious and respected. Then the new millennium dawned and reality television took over the airwaves like a cancer, spreading with reckless abandon and swallowing intelligence and reason within its darkness. Ghost Hunters started with such promise. The first two seasons saw most places debunked and not much occurred by way of evidence. It was more telling of what really goes on in front of and behind the scenes of ghost hunting groups. Then it became popular. The network suits saw dollar signs and everything changed. Over the years that show has become less about the science and more about the hype. Ghost Adventures, Ghost Lab, Most Haunted, Paranormal State, and their like all followed suit with melodramatic acting, gimmicks, and sensationalistic nonsense. Science took a back seat to ratings. Ghost Hunters, for example, has a staging crew that sets up a place before their arrival. They’ve now added gimmicks like taking a dog with them on investigations. Forget the fact that Jason Hawes repeatedly said in the show’s beginning that they respect but stay away from mystical techniques; let’s also keep in mind that anyone knowledgeable in psychic abilities knows that cats are the animal to use in a ghost hunt, not a dog. I’m serious on that point. Their latest Hollywood makeover is to have comedian Jerry Seinfeld do the show’s narration and they routinely have “guest investigators” who are actors on other SyFy series as a cheap and easy cross-promotional advertising tool for the network. The “fans” just eat it up. Meanwhile the anti-science cancer continues to eat away at their critical thinking skills. The fans emulate their television heroes by breaking into abandoned homes and cemeteries in the dark of night and “investigate,” then have the grapefruits to proclaim to the world that they are scientists with unquestionable proof of paranormal events. All of this led to August 21, 2013. That’s the date that ghost hunting lost its battle with brain cancer and was pronounced dead at 21:00 EST- that’s the moment the season finale of SyFy’s Paranormal Witness aired. None other than Sebastian Smith himself directed the episode. Horror fans know who he is. For those who might need a reminder, in 2007 he was one of the minds behind the low-budget UK flick Dead Wood. Seriously. A horror filmmaker is now directing “reality” television that’s supposed to be about science and fact. If there was any lingering doubt that reality television of any type wasn’t scripted nonsense it must surely be gone now. The episode involves the “Lynchville Secret” and tells the story of a single mother whose dream of a new life for her and her daughters is disrupted by the presence of malicious spirits from the Old West and a one-hundred-year-old secret. Boy, if that doesn’t sound more like a summer blockbuster and less like a scientific expedition. I have books, parapsychology research journals, and other reference material going back decades in my office library. Not one of them has even a mention of the so-called “Lynchville Secret”. If this story/activity has been around for a century then surely somebody must have said or written something by now. Therefore, I took to the internet. No good their, either; just endless pages and links with reviews and airdates for the SyFy episode. Shows like this need to have a Do Not Resuscitate clause in their contracts. These “gimmicks” that these shows have been reduced to using are like feeding tubes and life support, keeping these shows going long after they should have been laid respectfully to rest. When you produce a show that’s supposed to be about learning and science and instead it must resort to smoke and mirrors just to keep it relevant then it’s time to just pull the plug. It’s the respectful and honorable thing to do. 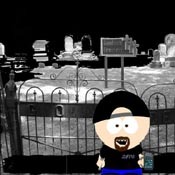 So it is that we lay to rest the fad of ghost hunting. May it go quietly into the night and slip gracefully over the veil that lay across the great divide. We’ve all had it happen, you see a dark shadow from the corner of your eye, but as soon as you turn to look at it straight on, it’s gone. Almost as if it dove out of sight on purpose, but how could that be? There is an even more alarming experience. Something startles you awake in the middle of the night, you see a dark shadow standing at the foot of the bed, watching you. This has to be a trick of the light or maybe you’re not fully awake and your eyes need to adjust right? Not necessarily. There have been numerous reports of these shadow beings, also called shadow people or shadow men. Even more numerous are the theories regarding their intentions for visiting us. Sightings differ; some witness a thin wispy shadow, barely holding a form that seems to float away quickly, into the darkness. Some even seem to go through walls or up into the ceiling. These appear to be the most common sightings. They seem to avoid contact at all costs and are not happy about being spotted. Another type that is commonly seen is much more confident. They are human like in form, usually appear to be male as most of these beings, yet they do not seem to hide so quickly. Some have reported coming face to face, or shall I say “faceless”, with them or seeing them standing very still in the corner of a room, barely noticeable at first. Then you see it, this shadow is much darker than any other shadow in the room. There have been sightings of a much more sinister type of shadow being, usually appearing in a fedora type hat or even a cloak at times. Some have even said they’ve witnessed glowing red or green eyes, or no eyes at all just vacant black holes. So many different types of these beings but what are they? Once again, theories abound. The most common is these beings are from another dimension and come in and out to simply learn and observe. Another very common suspicion is that these are a type of alien, visiting from another planet, but again just to watch, as if we were their own personal reality show. Less talked about is the theory that these beings may be the result of someone else’s astral projection trip. If someone does manage to have an out of body experience would their astral body appear as a dark faceless shadow? The more sinister “hat man” or “cloaked” beings have been called demons, or even omens, warning someone that they are of ill health or about to pass on, especially since the cloaked form resembles a grim reaper . Even the size of the shadow can differ usually from three feet to six feet and how often they appear can also range. Some people will see them almost daily for a few years and then not at all. Children may see them often but never as adults. When they choose not to ignore you, the actual encounters are rare but leave a lasting impression, people report feeling frightened and drained of energy, as if the being is absorbing your emotions into themselves. If touched, these shadow entities can feel like pure electricity or even several degrees colder. The rare malicious ones will try to intimidate the “victim” making them feel as if they are surrounded by darkness, suffocating, or even brief paralysis such as Old Hag Syndrome. Bite wounds, and scratches have been reported in these attacks but so few of them have occurred or have been brought to the public’s attention. One of my favorite explanations are these shadow people are a type of “men in black” who appear after a UFO or alien sighting to intimidate the witness to forget what they saw . 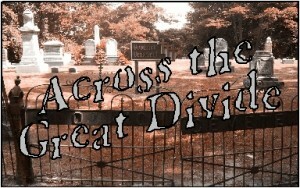 Whatever they are, they have been a huge topic of conversation in the paranormal community. Very few have actually been photographed and though they are human-like but not human or known to vocalize, EVPs cannot be taken. Hopefully more solid information will be available one day, we can learn just as much from them as they can from us. I have always had a fascination with the different ways to conjure up ghosts and spirits, though I personally would never attempt to do so because the risks are too great. I spoke before about the Ouija Board and how it stuns me this is marketed as a “game” for kids to play. If you are inexperienced and unprepared the danger of inviting the spirit world in is immense. Bloody Mary is another example I have talked about, a game that young people play at sleepovers trying to call this vengeful spirit to appear in the mirror. Recently, I have come across more modern versions of “games” believed to call spirits if you follow the instructions carefully. The Midnight Game or The Midnight Man is a recently popular one. There are countless videos and blogs online of people attempting this ritual. The introductions to the game always say that this was an ancient Pagan Ritual to punish those who did not follow rules, I am not certain of the truth behind that statement. Those who are unfamiliar with Paganism are already uncomfortable with the term so I assume it adds to the “spooky” aspect. The rules of this “game” say you must write your name on a piece of paper, put a drop of your own blood on it and light a candle. Once the candle is lit, place it in front of the door on top of the paper. They specify the door must be wooden. Then the player is advised to knock on the door 22 times and the last knock must be exactly at midnight. Open the door, blow out the candle, and then shut the door. This has allowed the Midnight Man into the house. You are then told to light the candle and continue moving around the house avoiding the spirit at all costs. If your candle goes out, you must immediately relight it and keep moving. If the Midnight Man catches you it is said you will have horrible hallucinations of your deepest fears. Salt is advised in case you cannot relight your candle, to place a protective ring around yourself. This continues until 3:33am, then the game is over and the spirit will leave. Once again I do not advise attempting any of this. One Man Hide and Seek or One Man Tag is another piece of insanity I came across. This “game” says you must have a doll with arms and legs, remove the stuffing and fill it with rice. Rice is believed to attract spirits. They also advise you put your own fingernail clippings in the doll. Sew the doll up with a crimson colored thread and bind the doll with the remaining thread. Name the doll, to make it more powerful, or so the rules say. Take a cup of salt water and a sharp object to wherever your hiding spot will be. Take the doll to the bathroom, and say three times your own name and that you are the first “it”, and then place the doll in a tub of water. Turn off all of the lights in the house and leave the television on a static, white noise channel. Go to your hiding spot, cover your eyes and count to ten. Return with your sharp object to the bathroom. The player is then instructed to stab the doll and tell the doll that it is “it” now and leave the sharp object and the doll in the tub while you run to your hiding spot. The doll is supposed to come to life by a spirit inhabiting it and start searching for you. The purpose of the television being on is to hear the changes in the volume or the static sound changing to whispers or voices from the spirit. To end the game you are suppose to take a drink of salt water and hold it in your mouth, take the glass with the remaining salt water with you and search for the doll. Once found pour the salt water on the doll and say three times “I win” and cut the thread to release the spirit. These “games” are very dangerous and in my descriptions I have left out specific details to prevent anyone from attempting such things and it working. Salt, mirrors, water and fire are all powerful things used for centuries in spirit contact and communication. Inviting spirits in is extremely dangerous and can result in terrible unwanted experiences. Do not make yourself vulnerable to such things. These are not “games” by any definition of the word. We’ve covered how to blend spiritual work into paranormal investigations in one of the earliest series for this column; and how the psychology of perception shapes our paranormal experiences; as well as a plethora of discussions on how scientific principles and methods apply to paranormal research. Through it all, we’ve seen that the realm of parapsychology is a very unique and complex field with theories that span the entire spectrum of human experience- from philosophy and spirituality to environmental science and physics. Recent surveys suggest that more than 67% of Americans hold some sort of belief in paranormal activity, and that number is expected to increase according to research by sociologists and other scholars. That interest is, of course, driven by entertainment on both the large and small screen from the likes of the Paranormal Activity movies and ghost hunting “reality” shows. More than half of Americans also believe in the existence of extraterrestrial life- or at least the probability of it. This is largely due to the advancement of technology capable of searching the universe for planets in the “habitable zone,” those capable of either creating or sustaining life in even its most basic forms such as those recently announced by NASA. Statistically speaking, those who express a belief or personal experience in paranormal activity are not the odd ones out anymore as the cultural landscape of America changes. It used to be that to say you had a ghost in your house was met by a raised eyebrow and a call to the men in the white coats. Now it is met by fascination. By contrast, Europeans tend to think it odd if your house is the only one on the block not haunted. The widening interest in the paranormal has taken on a model that sociologists point out goes back to the earliest hunter-gatherer societies. While men typically want to go out and capture something to prove its existence, women tend to want to use that information to improve themselves, become better people, and help others. Sociologists Christopher Bader and F. Carson Mencken of Baylor University and Joseph Baker of East Tennessee State University report in their new book, Paranormal America, that unmarried and cohabiting individuals are far more likely to embrace the paranormal. On a side note, they also found that Republicans were “significantly less interested” in the paranormal than Democrats or independents. At the core, though, they found that a conventional lifestyle and the firm grip of conformity were strong factors in non-believers while those with highly unconventional attitudes tended to look at explanations beyond the confines of mainstream thought. Over the years, the most controversial- yet frequent- discussions that I’ve been part of on the subject revolve around the delicate minefield that exists between religion and the paranormal. The groups most likely to remain on the side of non-belief are atheists, fundamentalist Christians, and Jews. In fact, the most committed of those individuals-, those who attend services weekly- are among the least likely to hold paranormal beliefs. Those who believe the Bible is the literal word of God are also highly unlikely to entertain the existence of ghosts, clairvoyance, and other related phenomena. However, a new generation of spirituality seekers is opening their minds- and their wallets- to the belief in the paranormal and other phenomena not easily discussed among the more mainstream of religions. There are some stark contrasts among the debates regarding the relationship between religion and the paranormal. Some suggest that those whose beliefs are outside that of mainstream religion embrace the paranormal as a substitute for a personal philosophy. Others say that religious individuals, who are already open to transcendent ideas and godly abilities, would be more likely to hold paranormal beliefs. Most people tend to occupy the middle of the spectrum, though. These individuals, who are not regular attendees of services, have an interest in religion but maintain a greater acceptance in the paranormal. Belief in paranormal topics was found, for example, to be at its highest among people with more liberal views of the Bible. What is particularly interesting is that the very core of most religions contains concepts and imagery that is very much paranormal and unexplainable. Many shrug of ghosts as being the stuff of fantasy, yet hold an adamant belief in angels, demons, and other spirits who carry out the will of God and the Devil. What of clairvoyance, telepathy, and other related phenomena? Was Joan of Arc crazy or did she really have a telepathic link with God? Muhammad received his visions through dreams with the angel Gabriel. The very basis of religion, it seems, demands a belief in the paranormal in order to make sense of the stories that have been passed down since antiquity of angels and demons walking among us and carrying out magical acts that defy logic and science. Perhaps the answer lies out there, in the middle of that minefield that lies between religion and the paranormal. Are you brave enough to unlearn what you have learned and step into the unknown? See you out there. Prompted by the unseasonably warm weather scores of people are venturing outdoors, eager to get a jump on summer fun. For many in the Detroit area that also includes picnics and other activities on historic Belle Isle. The park, located in the Detroit River and open to the public, is the largest island city park in the United States. 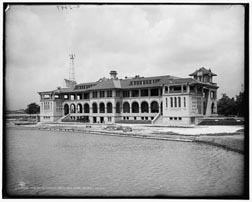 In 2005, the then 101-year old Belle Isle Aquarium was the oldest operating aquarium in the United States but was closed to cut costs in the city. But unknown to few, besides some lifelong citizens of the Motor City, Belle Isle is much more than a serene picnic experience; as with many locations with such a long and varied past, it also has its share of urban legends and ghost stories. The story goes that if you drive your car onto a bridge that’s on Belle Isle, turn your engine off and honk your car horn three times, a spirit will appear from the woods, motioning for you to follow her. I should note that there have never been any confirmed reports of anyone following her into the woods. For generations the tales of the Belle Isle ghost lady, also referred to as the Snake Goddess of Belle Isle, has attracted adventurous midnight riders to drive through the scary woods in hopes of catching a glimpse of a woman in a long white gown. The ghost of Belle Isle has a couple different versions to the story, too. Some say that there is a certain bridge that must be approached, while others claim that any bridge on the island will call this spirit. One version even describes her as an elderly woman. Belle Isle has historically had a rich Native American heritage that continues to this day, so it is not surprising that most of the well known tales involve local tribes. Ottawa legend tells of the daughter of chief Sleeping Bear. Her beauty was so striking that he kept her hidden from the eyes of young suitors by hiding her in a covered boat on the Detroit River. One day when bringing her some food, the winds, awed by her beauty, blew the covers off of the boat and it floated down the river. As it floated past the lodge of the keeper of the water gates, he also was stunned by her beauty and retrieved the boat and brought the young beauty into his tent. This angered the winds and the wind knocked him around until he died. The winds, sorry for uncovering her beauty, returned her back to her father and begged the chief not to hide her from them again, but to let them enjoy her beauty. To protect her, and fearful that other men would follow, he placed the princess on an island in the Detroit River and sought the aid of the Great Spirits to protect his beloved daughter by surrounding the island with snakes to protect her from intruders. There she could run free with the winds around her. The spirits immortalized her by transforming her into a white doe and letting her live out eternity on the island. When settlers learned of the island and the story they named it Rattlesnake Island. Shortly after, it became known as Belle Isle. To this day, the maiden’s spirit can be seen from time to time dancing in the wind on the island, and is often mistaken as a deer by witnesses. So as you enjoy the sunny skies and warm weather, perhaps those near southeast Michigan might find themselves spending a day on this historic island. Later, as twilight nears, those of you brave enough might stay a while in hopes of catching sight of the island’s famous Lady. If you do, please share your experience. Until next time, happy hunting to you as you travel across the Great Divide. I am contacted periodically by people and asked my opinion on a variety of paranormal “evidence.” While it really sparks my interest and imagination to find a valid photo, recording, or other bit of data that can lend credence to the field, the sad truth is that these incidents are few and far between. I’ve fallen victim to the excitement myself while on an investigation or training exercise and ‘chimped’ about like a fool thinking I caught something when, in fact, it was unwarranted. Nothing is more disheartening than to present “evidence” to the scientific community only to be laughed out of the room. There’s nothing wrong with that. Quite the contrary, it sharpens your skills as an investigator and you’ll know what to recognize and what to look out for the next time. What doesn’t kill us makes us stronger, right? It breaks my heart to disappoint these folks, but it happens to me more often than I’d like to admit when I am shown print after print of dust that a person is positive is an “orb.” Ah…the dreaded orb factor. My only advice is to clean your living room more often. I’ve said it before, and as of late it bears repeating- 99.9% of these so-called “orbs” are dust or other debris being reflected back into the camera. If it is transparent in the slightest measure, then it is dust. Period. If it is generating its own light or energy, is moving in patterns that can’t be explained through chaotic motion, and is solid, then you might have something. Recordings are a beast unto themselves and are really difficult for me to be conclusive on for a variety of reasons. First of all, I was not present when these were captured so I have no way of knowing who was there, what the environmental conditions were, or many more x factors than I can even comprehend at this time. I have to take all informatio9n at the word of the presenter. That’s why it takes me a long time to properly analyze recordings. I have to backup the originals (remember, you should only work with copies), run them through various filters and analytics to clean up the sound, get consensus and thoughts from my other team members, and sometimes even send them out to third-party forensic labs for clarification. I’m working on just such a case right now and will be getting the results to the client next week. I’m excited because while one recording was a bust, another did produce something substantial. Once I get the client’s take, I’ll be able to present it on our group’s site and Facebook page. 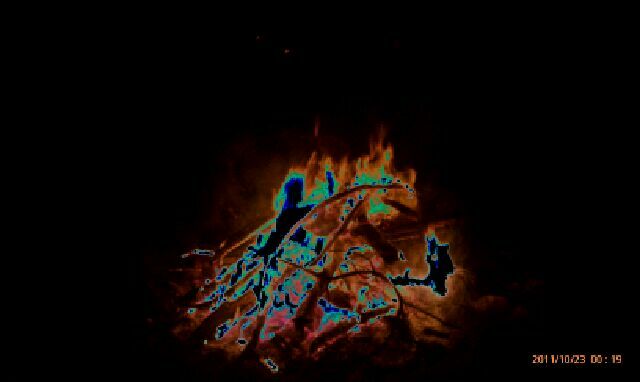 Speaking of which, last month at a Super Bowl party I was shown an image from someone’s phone of a bonfire in October, 2011. The person admitted that they used some type of filter effect on the iPhone to produce it, so if any iOS users out there can help me with what exactly they did, I’d be much appreciative. I posted the image on our Facebook page to get the public’s take on it. 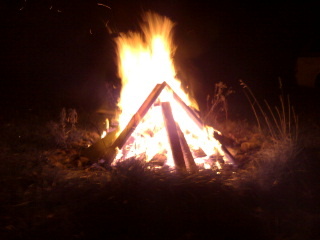 It definitely made me raise an eyebrow, plus I thought it was a damn cool picture. After asking, I was not able to get this exact photo in an unaltered state, but I was given another image from that same night and it helped shed a little insight into the situation. For one thing, depending on the position of the camera, any of the items in and around the campfire could produce the paranormal effects. Notice the structure in the background to the right of the image. Depending on how the flames and smoke were coming off of the fire and relative to its position, it could cause the odd-shaped humanoid figure present in the first image. This brings up another point. I was told from the start that the first image was enhanced with what I can only speculate is some kind of spectral color filter. Okay, take a look again at the figure on the left side of photo #1, then compare that to the smoke just barely present in the same area of photo #2. If color or heat filters where used it would force the smoke to show up in various shades of color depending on the temperature of the smoke. Voila! Instant ghost photo! So, dear readers, what do you think? Fact or Fiction? The floor is yours. 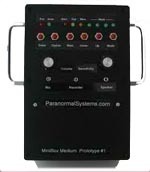 The various ghost hunting “reality” shows that plague the airwaves have given a great deal of attention lately to an amusing new line of gear that merge EMF, audio recorder, and K-II devices all in to one unit; some even assert to turn this data into spoken words that they spout as proof of spirit contact. While in theory this sounds fantastic, in practice it’s a very different, very sobering, reality. Not only are these devices laughable at best, but these “professional” ghost hunters are actually trying to pass off the data from these devices as legitimate evidence of paranormal activity. These devices are complete crap. Come on, folks- this is supposed to be science, not a scene from the set of Ghostbusters III. There are numerous versions of these devices readily available for sale on eBay, and YouTube abounds with video clips of their supposed findings. It’s no shock to learn that the fine “professionals” over at Travel Channel’s Paranormal Adventures swear by these toys. That, if anything, is proof enough to discredit these devices and their data. I first came across this type of device a few years ago when I heard of the Ovilus. Created by Bill Chappell of Digital Dowsing and appropriately labeled “for entertainment only,” it claimed to translate EMF fluctuations into phonetic speech by converting the EMF readings into numbers, and then those numbers into words by sounding them out using text-to-speech algorithms via a vocabulary of 512 words. Various modes on the device include speech mode, using the environment to pick the words to say; phonetic mode, using the environment to create words phonetically; commutation mode, using speech mode and phonetic mode together, EMF Mode; yes/no mode, to ask questions and get yes or no answers (a digital Ouija board? ); level mode, to watch the energy change in the environment; and dowsing mode, to work like a pair of dowsing rods. It is powered by a battery and is equipped with a headphone jack, a recording jack with attenuated output, and something called the ‘Paranormal Puck.’ The Puck is designed to aid in paranormal research and meant to be the “center” of investigation as a place to gather, log, track and maintain the data. It also watermarks data to prevent tampering. Users note that it can be “randomly repetitious” at times by stating selected words for every question asked and every environment investigated. *ahem* Really? Say it isn’t so. The first question that comes to mind is how can the inventor of this device possibly test the results? What evidence or reasons are the formulas based on? Whatever method he used to equate EM energy with words would have to start as an arbitrary guess. It would then need to be tested repeatedly to verify the results. In any case, this makes me think of the dog collars that supposedly turn barking patterns into words like “outside” and “water;” seems to me that this is just another example of wannabe researchers barking up the wrong tree. Known as the “Radio Shack hack,” it was discovered in 2007 by a retired electrical engineer. These are modified AM/FM radios that continuously scan the various bands to create white noise in the belief that entities can use the audio falloff from broadcasting stations to communicate. One model, the 12-469, simply produces a clicking sound when scanning through the bands; other models are modified armband FM radios from the likes of Jensen that are common among joggers. A man named Frank Sumption invented a version of the device after experimenting with software to record EVPs. His device would produce random voltage to create raw audio from an AM tuner, which was then amplified and filtered into an echo chamber for recording. What makes these boxes unique in terms of EVP analysis is that in addition to being modified to record the sounds, because that they were originally radios they are equipped with external speakers that proponents say can be used for real-time two-way communication with the other side. Not surprising, many users report that results of the ghost box are affected by the strength of the radio signals in the area; poor signal quality reduced the ability for spirits to make contact (insert facepalm slap here). Furthermore, what conclusive proof do users have that the voices are indeed paranormal in nature and not simply the broadcast of local stations? Depending on the atmospheric conditions one could even pick up a station from great distances. This is not unlike an experience I had with a CB radio some years back. While driving in the northern suburbs of Detroit one clear summer night I ended up in a chat with a trucker outside of Las Vegas! Anyone with the latest generation of Smartphone can even download an app (often for free or a few bucks) that claims to do the same. Ghost Radar is one that comes to mind that I’ve come across myself from the Microsoft Marketplace. These are toys, nothing more. If that’s your team’s idea of science, stay at home and play Angry Birds instead. I’m all for inventiveness, and I think some of the reasoning behind these devices has some merit; but these self-made devices are tainted by their very nature. No conclusive proof could ever possibly come from them unless the findings can be proven using other verifiable equipment as a control measure. As with the field of paranormal research itself, the tools and theories behind them need to go through extensive experimentation and testing to prove or disprove their validity for recording and measuring paranormal activity, let alone the resulting data that is collected by them. One again we have the misguided practice of amateurs do disservice and disrespect to science. I applaud those who invent these ghost boxes, as necessity is truly the mother of invention; but I must condemn their inept notion that anyone with an intelligence greater than a garden radish take their findings seriously. The Ovilus and the various ghost boxes need to undergo years of intensive experimentation in various settings and controls to not only prove their worth, but decisively identify what sounds or readings mean exactly which words or phrases. I’ve said it before, and I’ll say it again- it doesn’t matter how new or fancy the technology is, a tool in the hands of the unwitting is just a toy. As always, happy hunting in your quest for knowledge, and here’s to a very happy new year! We left off last month discussing some of the mainstream scientific and environmental factors that contribute to paranormal research and ghost hunting. I touched on many of those topics as best I could and ended with a mention of how the Moon affects investigations. We’ve got a whole new month and column to stretch out our minds and comfortably talk about this important aspect of our otherworldly stroll. The Moon has played an important role in spiritual and psychological matters for as long as there’s been recorded history; many modern terms, such as lunacy, derive from the effects that the Moon is claimed to have on our psyches. As the lunar cycle waxes to full, incidents of psychotic behavior, violence, and crime seem to escalate; the phase of the New Moon also seems correlated to a rash of abnormal behavior. Current understanding of human psychology and physiology supports the observation that the Moon can exert significant influence on the human mind. But is there really any scientific support for such claims? Well, it so happens that this pattern has been proven in a variety of studies. The Journal of Clinical Psychiatry (1978); a 1987 survey; and at the University of New Orleans (1995) are a few examples. Statistically, the studies found that psychiatric admissions actually drop at the New Moon, but that they increase during the first quarter; homicides, suicides, aggravated assaults, and fatal traffic accidents all increasing as the Full Moon arrives. As a professional in the psychology field, I find this interesting. If the Full Moon exerts an influence on rising ocean tides and also an increase in erratic human behavior, and psychiatric admissions drop at New Moons, that supports a hypothesis that the gravitational pull of the Full Moon is counteracted by the equal but opposite effect of the New Moon having an adverse effect on the chemical imbalance in the brain, perhaps due to a reduction in the gravitational pressure exerted on the fluids within the body. It is well established in science that the Moon’s gravity is the cause of the ocean tides and affects many different phenomena in weather and nature. The Earth is mostly water; but the human body is also made up of mostly water to the same percentages. So if the Moon affects the planet due to its abundance of water, why not the creatures on the planet made up of the same materials? As long as we’re discussing the Moon’s effect on water, it may be interesting to note that sites with poltergeist activity report unexplained drops or small puddles of water in the room, and in general more poltergeist activity is reported near water; many poltergeist reports involve kitchens. Several of the best EVP recordings and other captured evidence for hauntings occur near streams or in close proximity to groundwater. Early studies suggested that running water may generate a frequency that renders some people more sensitive to psychic phenomena. Some scientists argue that the lunar effect on gravitational forces doesn’t just affect the tides, but are linked to earthquakes as well. A study of 2000 earthquakes demonstrated that they occurred when tidal forces where over the epicenter of the earthquake. The study showed that there seems to be a lunar trigger. Another study in 1978 found that the Moon triggers particle flow, which disturbs the Earth’s magnetic field. Eclipses are known to have an effect on the conductivity of the atmosphere, especially the E-region, which in turn affects the Earth’s geomagnetic field- the largest effects occurring in the morning around the time of equinoxes. A 7.4 magnitude earthquake in Japan occurred on the same day of the joint winter solstice/eclipse on December 21, 2010. So if a major parapsychological theory contends that paranormal activity is tied to fluctuations in the geomagnetic field of the planet, then it stands to reason that investigations can benefit from close association with lunar events to produce effective results. Activity often increases on the anniversary of death, especially if the Moon was full or new on the date that the person died. A possible cause of this is due to the gravitational forces being increased and therefore providing additional energy to bridge the gap between the different planes of existence. Whether or not the person’s death correlates to a Full or New Moon, it’s wise to check for increased activity on those nights each month, or on whichever moon phase was nearest the time of death. Paranormal activity is often easily influenced by subtle factors so it’s possible that the Moon has a greater effect on them now that they exist in the non-physical realms. Some researchers have noticed slightly better statistical results during investigations held during the New or Full Moon. In addition to the effects of the Moon on spirits, researchers can have greater psychic sensitivity during the Full and/or New Moons. The Full Moon has been shown to affect the physical body, including menstrual cycles (which in turn affects the body mentally and physically); whereas the New Moon is related to increased influence on mental states. There is definitely a lot of room for speculation about lunar cycles and increased paranormal activity, or perhaps more awareness of it. 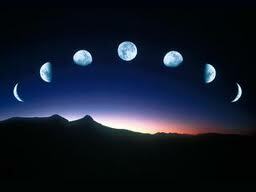 So, have any of you noticed an increase or decrease in activity during certain Moon phases? Is there any credit to these theories, or is it all just lunacy? Let me know what you think. The floor is yours. Just typing the words “ghost on film” into any search engine will bring up thousands of photos containing “ghosts” or “spirits”. Many can prove quite disappointing when authenticity is a factor. With modern technology almost anyone who has spent time with Photoshop can create a convincing “ghost” photo. Before the digital age when film was developed, or let’s not forget the Polaroid, many believed a ghost was captured whenever a blur, streak, or double exposure appeared. So how can we tell what is real and what is fake? Research is important. Examine as many “ghost” photos as possible, the good and the bad. Some will be quite obvious as faked. A few famous ones that have recently circulated are one of a young man standing outdoors with a “ghost girl” standing eerily behind him. The girl is nothing more than a digitally placed image of the famous staple from most Japanese horror films. You know the type, long dark hair, usually covering the face, gaunt skeleton like features, and a look of terror in her eyes. The image appears in many “ghost photos” which is one of the first indications that it is not real, and second the image is very clear. Usually in the rare occasion a spirit does appear it is usually transparent and very rarely a full body with distinct features. When this does happen it definitely isn’t long enough for the spirit to pose for the camera. Another popular photo circulated several years ago as part of a chain letter. The photo shows a girl in a hospital bed with a frightening looking woman lying directly underneath. Once again the woman has a terrified look on her face and very gaunt features. The letter circulated via email or some social networking sites and stated that once it was viewed you had to send the photo to at least five other people or the woman under the bed would come to you that night. While a good ghost story, the photo was nothing more than a movie poster from a Thai horror film. Many “ghost” photos contain orbs. These are circular objects believed to appear when a spirit is attempting to manifest itself. These round, transparent objects are thought to be energy. Unfortunately, a majority of these “orb” photos are taken outside or in very old locations and dust particles can create the exact same image on film. Unless the orbs are forming together to create a shape or moving independently in a specific pattern, it is more than likely dust. There are other photos that contain captions that tell you what to look for. Like a face over someone’s shoulder or demonic hands reaching out from a wall. Usually these are simply shadow play or a double exposure making someone appear transparent. This uses the minds ability to see whatever is suggested. If you were to observe the photo without suggestion of a ghostly shadow, you more than likely wouldn’t see one, but to observe the photo with the shadow circled and highly magnified with the caption stating there is a ghostly face, the mind will look for that exact thing. This is simply human nature, to attempt to make sense of the image, similar to finding shapes in clouds. When I visit a reportedly haunted location, I take many pictures. Often I’ll snap the same picture several times. There is always a lot to go through upon review but this helps to sharpen skills in looking for subtle changes. When something odd is seen on a picture I ask myself several questions. First if there was any glass such as in a museum. When a flash reflects off of glass it can create a ghostly glow. Also someone else standing near may be caught in a reflection so I take into consideration if anyone else was around. I make sure there was so artificial light, such as headlights from passing cars or flashlights. If the picture is taken outdoors there can be bugs that can create a streak of light across the picture if caught just right and animals can create bizarre shadows as well as ghostly glowing eyes. Many things can be contaminates to spirit photography so it is important to recognize these things, practice makes perfect. I’m in no way saying it is impossible to catch a ghost on film but it is rare. Some people go years without capturing anything worth consideration. Ghost hunting takes patience and perseverance. Take as many pictures as you can even if it is purposefully with the above mentioned contamination factors. This will help you to know exactly what you are looking for and what to dismiss.